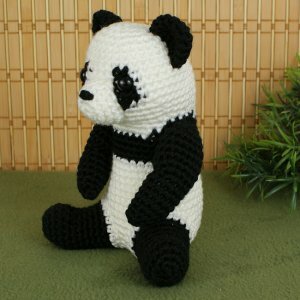 An original crochet amigurumi Giant Panda pattern by June Gilbank. Make your own realistically shaped and coloured black and white panda! Details: Although the colourwork makes this pattern slightly more advanced than a basic amigurumi, there are only 8 rounds with multiple colour changes throughout the pattern, so you shouldn't be intimidated! The pattern notes include bonus tips - specific to this pattern - to make the colour changing easier and ensure you'll get a beautifully tidy result. Note: The bamboo stalk is not included in this pattern - it's taken from my Lucky Bamboo pattern, which you can buy separately. However, the Giant Panda pattern does include the modifications for turning the standard Lucky Bamboo pattern into the freestanding panda-sized bamboo stalk. Date Added: 09/26/2015 by Jaclyn M.
Date Added: 12/02/2012 by Chrisie M.